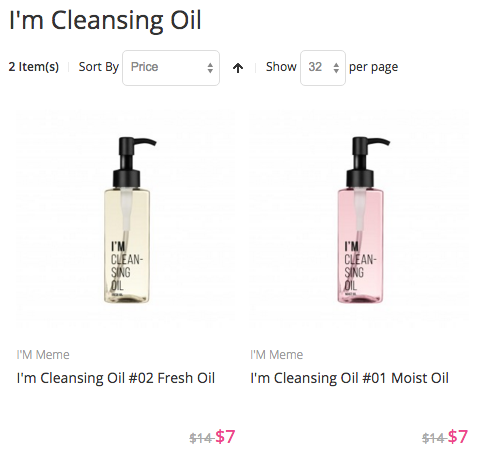 Anyone waiting for the Memebox house brand skincare line to expand can rejoice - I'm Cleansing Oil has just been released in two varieties and at a price that is too good to pass up! This post contains affiliate links that keep this blog up and running. I'm Cleansing Oil in #01 Moist Oil is formulated with nourishing oils that provide dry skin types with a strong layer of moisture barrier. >Deeply nourishing oils: Olive Oil provides a radiance glow, Avocado Oil restores skin's elasticity, and Camellia Oil strengthens skin's barrier. I'm Cleansing Oil in #02 Fresh Oil is a lightweight, watery oil that gently removes makeup, dead skin cells, and pore-clogging impurities. Your skin will be left feeling fresh and powdery soft, never uncomfortably greasy. >Fine Micro-Oil with micro oil particles deeply penetrates the skin to remove pore-clogging impurities. >Creates moisture barrier with a blend of botanical oils and White Flower Complex (Lotus Flower, Jasmine, Freesia, Edelweiss, and White Rose extracts). Try coupon code "NEWYEAR2016" for 10% off ~ orders must be above $30 after coupons for free shipping (one time use per account). New customers may save 20% on your first order using [this link]. Disclaimer: No monetary compensation was received for this post. The Glitter Chic blog will always provide honest opinions, beliefs or experiences on products reviewed. If you have any questions, please contact me at gothickornchic at gmail dot com. This blog contains affiliate links and I may receive a small commission if you make a purchase using one of those links. The disclosure is done in accordance with the Federal Trade Commission 10 CFR, Part 255 Guides Concerning the use of Endorsements and Testimonials in Advertising.